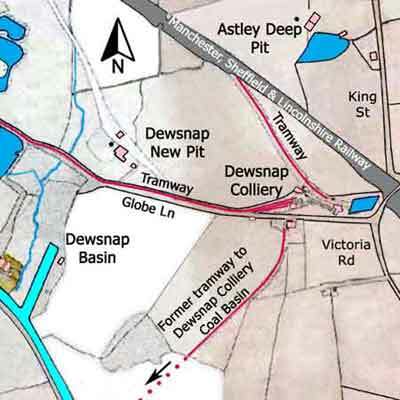 The Tithe Map below shows Dewsnap Basin in the context of three pits originally owned by the Dunkirk Coal Company, namely, Dewsnap Colliery, Dewsnap New Pit and Astley Deep Pit. 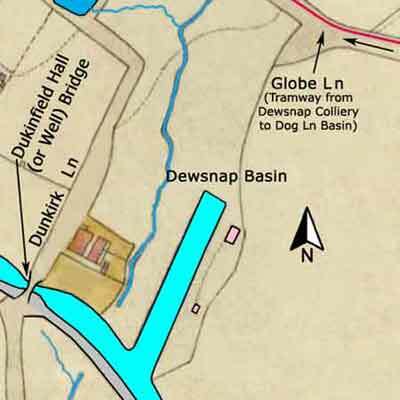 The map also shows Dewsnap New Pit and Astley Deep Pit as not then being connected by tramways to the Peak Forest Canal at Dewsnap Basin but the older Dewsnap Colliery is shown connected to the canal at Dog Lane Basin by means of a tramway running down the length of Globe Lane to Globe Square and then the short distance down to the basin. 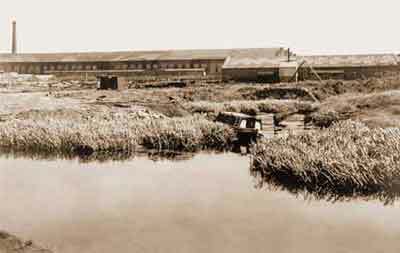 Formerly, Dewsnap Colliery was connected by tramway to the canal at Dewsnap Colliery Coal Basin. In 1850, this tramway and its associated basin are shown as being abandoned. The reason for this was the closure of Dewsnap Colliery and its replacement by Dewsnap New Pit about 273 yards to the west, which was sunk in 1845/46. The map also shows a tramway connection from Dewsnap Colliery to the Manchester, Sheffield and Lincolnshire Railway. Nevertheless, the tramways from Dewsnap New Pit and Astley Deep Pit to Dewsnap Basin are shown on Ordnance Survey maps of 1875, 1892, and 1908 although by 1908 they would have been abandoned. By 1922 both tramways had been removed leaving no trace of their former existence on the Ordnance Survey map of that year. By this time, the Carriage and Waggon Works of the Great Central Railway Company (formerly the Manchester, Sheffield and Lincolnshire Railway Company) had been built along the north side of Globe Lane on the sites of Dewsnap Colliery and Dewsnap New Pit. The tramway from Dewsnap New Pit to Dewsnap Basin passed over Globe Lane, whereas the tramway from Astley Deep Pit passed below it. The latter tramway also passed over the main line of the Manchester, Sheffield and Lincolnshire Railway. The boat, broken in two, is Henry.